Lots of people know Granville Island Brewing for their 6 packs and 12 cases but this is no longer brewed by Granville Island Brewing (and hasn’t been for quite some time) but contracted out by their Parent Company to the Okanagan. They still do brew beer on the Island and it is where they really shine! This is the original brewery although it has expanded since it was originally used to brew their regular beers. The brews that really excite me though are the 650ml (22oz) bombers that Vern brews here. Here creativity reigns and there is no meddling by their parent company. Not only do they brew their beer for bombers on site here but they also do growler fills in their tasting room! The tour of the brewery costs $9.75 and includes 3 four oz samples. Depending on your knowledge of beer the tour can be very informative or a really relaxed stroll through the brewery like my tour. They also have a great tasting room and store with lots of their beer as well as branded gear. 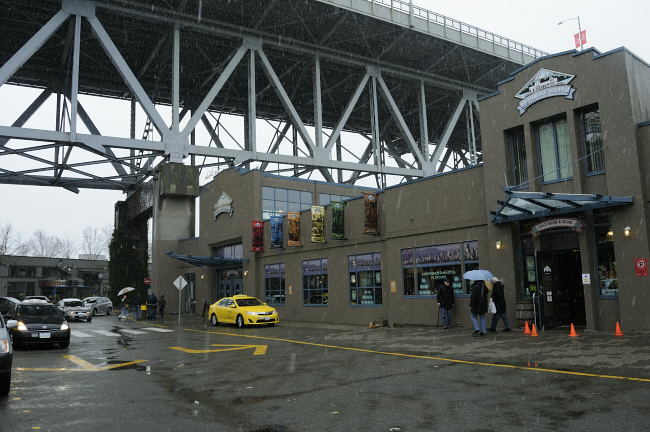 I recommend you head down here and check out what really excites me about Granville Island Brewing. Don’t let their owner scare you away from their local Vancouver brewed beer! I also would love to thank Granville Island Brewing for my personal tour! It was amazing to have a look in the brewery at my own pace!! This entry was posted in Brewery and tagged bc, brewery, canada, craft beer, granville island, granville island brewing, vancouver.